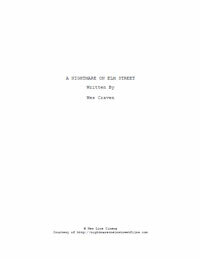 Dig your claws into Wes Craven’s chilling masterpiece by reading one of the final scripts for A Nightmare on Elm Street. New Line Home Video included this draft on the original DVD release in 2000. It is available here in PDF format. NIGHTMARE MUSIC THEME begins as we FADE UP on a SERIES OF SHOTS, all CLOSE and teasing. — A man’s FEET, in shabby work shoes, stalking through a junk bin in a dark, fire-lit, ash-dusted place. A huge BOILER ROOM is what it is, although we only glimpse it piecemeal. Then we SEE a MAN’S HAND, dirty and nail-bitten, reach INTO FRAME and pick up a piece of METAL. — ANOTHER ANGLE as the HAND grabs a grimey WORKGLOVE and slashes at it with a straight razor, until its fingertips are off. — CLOSE ON SAME HANDS dumping four fishing knives out of a filthy bag. Their blades are thin, curved, gleaming sharp. — MORE ANGLES, EVEN CLOSER. We can HEAR the MAN’s wheezing BREATHING, but we still haven’t seen his face. We never will. We just SEE more metal being assembled with crude tools, into some sort of linkage — a splayed, spidery sort of apparatus, against a background light of FIRE, and a deep rushing of STEAM and HEAVY, DARK ENERGY. — And then we see this linkage attached to the glove. — Then the BLADES attached to all of it. — Then the MAN’S HAND slips into this glove-like apparatus, filling it out and transforming it into an awesome, deadly claw-hand with four razor/talons gleaming at its blackened fingertips. Suddenly the HAND arches and STRIKES FORWARD, SLASHING THROUGH a DARK CANVAS, tearing it to shreds. 55. INT. BOILER ROOM. DAY. 55. NANCY comes off the stairs into a dank boiler room. The smear trail is there. It runs behind a cracking, red-hot boiler the size of a diesel locomotive. Everything about the place feels dreadfully wrong, and the MUSIC is deep into the NIGHTMARE THEME when it pauses. TIGHT ON NANCY. Slow terror moves into her face. There’s a low, sinister GIGGLE. 56. REVERSE IN HER POV — we see a tangle of pipes, shadows, and the tainted fire of the huge boiler. Then from behind this, deeply shadowed but still identifiable, steps TINA’s KILLER. The same filthy red and yellow sweater and slouch hat, the same melted face twisting into a smile, the same GARBLED LAUGH as he slides the long blades from beneath his shirt and fans them on the ends of his bony fingers. 148. INT. NANCY’S ROOM. NIGHT. 148. CLOSE ON NANCY’s face. VERY CLOSE. Her eyes stare ahead, red-rimmed, anxious. She picks absently at the thick bandage covering her forearm. The long cuts from Fred Krueger’s fingers are bleeding again, but she doesn’t even care anymore. Too late to sweat the small stuff. She crosses the room. INSERT CLOCK — ten minutes to midnight. NANCY’S eyes go to the door.